Audiotricks are a type of mashup that we created by completely re-dubbing professionally made movies. We started doing this in 2005, when we "discovered" how to mix AV cables to effectively redub VHS tapes with VCRs. The wires that we used are seen in the logo (left). 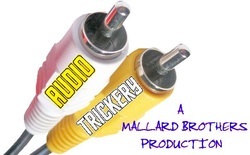 The resulting monstrosities of "Audio Trickery," the name of the process, were referred to as "Audiotricks." The dubs have a very distinct, horribly unwatchable quality, but can always put us into stupefied hysterics. Most objective viewers just get confused. Audiotricks involved the two of us watching a film while improvising all the dialogue, sound effects, and plot. Usually, we would be accompanied by random background music playing on shuffle. Sometimes, we would supply the music vocally, usually dramatic cues. Most Audiotricks are incredibly difficult to watch, but incredibly funny, as they offer a 90 minute, forced stream of consciousness. In 2009, or maybe early 2010, we recorded our 42nd Audiotrick and called it quits in favor of Quack Attack Riffs.